Delhi’s Radio space has become quite hot these days with more than 10 FM channels vying for a bigger chunk of the pie. Leaving aside a couple most of these channels are alike(at least to me) and unless you are an avid listener chances are you too won’t be able to tell X from Y. What really comes out as being Remarkable in this chaos is 104.8 FM or better known as “Meow FM“. 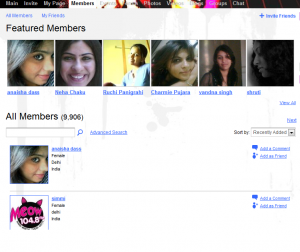 Talking about being remarkable, Meow(India’s first just for women radio station) that came to life in June 07 is easily the most unique one. I listen to it every once in a while and what follows are a few things that make “Meow” Remarkable. Instead of targeting everyone(which actually means targeting “no one”) they have focussed on Women folk, which is their biggest and probably best differentiator. This is a big plus as now they can mostly focus on airing programs that strike a chord with women without worrying much about the other gender. So now they can host a show like “Mama Meow” and even ask audience to tell “five innovative ways to break news about their pregnancy to their families” without thinking twice. 1) Talking/Sharing is one of the basic human necessities/traits. 2) It’s informative(knowledge sharing, listening and learning from other’s experiences and so on). 3) It has a HUGE audience(how else can you explain, people calling even before the host has finished telling the topic of conversation or people trying to call for days till they get to talk ?). Another thing that impressed me about Meow was the way almost all their hosts talk to their callers and build relationships with them. Be it addressing some callers by adjectives like “Darling” or “Sweetheart” or asking someone who called after a hiatus “Why are you calling us after a long time ? Don’t you love us ?”.The way they handle and treat their callers is simply amazing, it works great(especially with women) and am sure they must have made some real(off the phone) relationships with some callers.To summarize in one line “try to make each customer feel special”. I guess that’s what they are doing and doing it quite well. 1) Good content with a variety to target various sections of women folk. 2) Great marketing(by making a noteworthy statement with the usage/symbolism of word “Meow” and other things). 3) Roping in different people with public appeal like Dr Kiran Bedi and regularly having guest hosts. 4) Anil Srivatsa(those who’ve listened to his show know what I mean). These are some of things that I think make “Meow 104.8 FM” click, not sure about the RAM stats.They might make things a bit more cheesy from here and attract more earlobes by adding more girlie features on say shopping(discuss things like what you shop, where you shop or reviewing some shops etc) or better a gossip section(share the latest gossip in your office,college etc or in bollywood). This entry was posted in business, Strategy, The Remarkables and tagged business, client realtionship, delhi, fm, marketing, meow, meow 104.8 fm, radio, remarkables, Strategy, The Remarkables on March 27, 2008 by mayank.